Who’s Pat and what is she tested for? It’s not a who, it’s a what. Portable Appliance Testing. Safety first is important and periodically equipment needs to be tested for electrical safety. Today, Ezri from PatPlus came to the Sheds and conducted checks, labeling the equipment after testing. 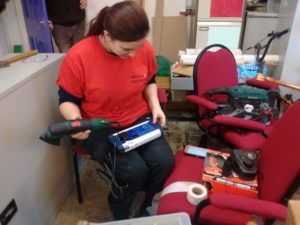 Ezri tested a total of 97 electrical items, condemning just one item, an extension lead. Solution? Bin and buy another! There were 64 items tested at SAMS and 33 at Eskmouth Scout Hall.